When mobile phones were becoming popular, a bit over 10 years ago, I jumped right on the bandwagon and got a Nokia phone. It was very basic, no color screen or anything, couldn’t text or take pictures. But I did have a changeable faceplate kind of thing. I had two different colors for it – metallic silver and matte purple. The purple one was my favorite. I only had it for a year or so. Then I didn’t have a mobile phone until one year ago! Yes, that’s right, I survived all that time without a mobile phone. People were carrying around fancy iPhones all around me, but I was stuck with a pen and paper (if I was even lucky enough to have those in my bag!) and if I wanted to tell someone something, it had to wait until I saw them in person! What a terrible way to survive! Just kidding, really, it wasn’t terrible. I kind of took pride in the fact that I could still survive using traditional methods of communication. But it was getting a bit out of control. These days, everyone who is anyone has a smartphone. When I got my first mobile phone in 10 years, about this time one year ago, it was yet another basic phone. It had a color screen, but no camera. I could text, but it took almost 10 minutes to punch out a single sentence using the keypad. My husband, on the other hand, was given an iPhone by his boss at work! Imagine how jealous I was when he whipped his iPhone out of his pocket and started checking his email or searching on the internet for something he was curious about! I was just beside myself with jealousy. See, I basically live through the internet; I check my email (and Facebook and Twitter) hundreds of times per day at our desktop computer. But I am just overwhelmed and fascinated at the thought of checking my email or tweeting in the car, or the train, at a restaurant, on the sofa or in bed in the middle of the night! Wow, how awesome! Recently, a friend of mine I’ve known for years offered to give me her iPhone 3GS as she, of course, had a shiny new iPhone 4. I took her up on that offer and received my very first smartphone yesterday in the mail. My husband’s sorting out phone plans for it. I’m pretty much clueless when it comes to mobile phone plans because I haven’t had enough of them to understand what the plans even mean (poor me!). I’m super, super excited to finally move up in the world; maybe now I won’t feel so out of place. I’ll finally be able to tweet from anywhere I like, and take pictures of meaningless things with Instagram, just like everyone else. Speaking of Instagram, I’ve had a crush on this for ages. Since I didn’t have my own smartphone to use Instagram with, I download Pixlr-o-Matic and started editing my photos in an Instagram-like fashion. Which brings me up to the real topic of this post – Zoku recipes! The pictures I took of these popsicles have been edited with Pixlr-o-Matic, so they don’t have the appearance of my usual photos. The original photos weren’t that great anyway, as I took them on gray, rainy days or later in the afternoon, when the natural lighting wasn’t so bright. They actually look better edited with Pixlr-o-Matic! So let’s begin. This first recipe is from the Zoku Quick Pops Recipe Book, and therefore I won’t publish the recipe to avoid copyright issues! If you do have a Zoku and don’t have the recipe book, I highly recommend purchasing the book. The recipes are really top-notch. 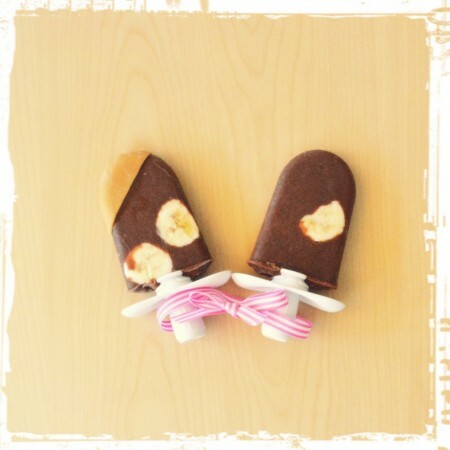 These are fudge and banana popsicles with peanut butter quick shell. These are amazing! The chocolate part is super fudgey-ish and even though the bananas are sliced so thinly, the banana flavor is strong. I liked the peanut butter quick shell, but next time I probably wouldn’t add it to these pops. They tasted wonderful without the peanut butter. Side note on these, I used a 70% Lindt chocolate bar for these. The next recipe is adapted from a recipe I’ve already posted about – Vietnamese coffee popsicles. They were just super strong coffee mixed with sweetened condensed milk (and a little bit of cocoa powder, but I omitted that for these popsicles pictured below). Those were really good. But, what if I were to use dulce de leche instead of sweetened condensed milk? What would that taste like? Well, it would taste pretty darn good! Unfortunately, most of this was actually drank (by myself) by the time I could freeze it all in the Zoku! Wow, these were just spectacular. I highly recommend these for hot days in summertime, when you want a coffee but prefer something colder. They’ll cool you down and give you that coffee hit, all at the same time! To make these popsicles, read the recipe at the bottom of this post. Lastly comes the most outrageous popsicles – caramel popcorn! Can you make popsicles out of popcorn? Yes, you can. This may not be everyone’s cup of tea, so to speak, but if you love caramel popcorn, this one’s for you. That’s my stripey daughter holding this dulce de leche-striped popcorm popsicle! The recipe comes from the Zoku blog. To sum up this recipe, you heat milk up on the stove with buttered popcorn and strain out the popcorn when the mixture is cool. 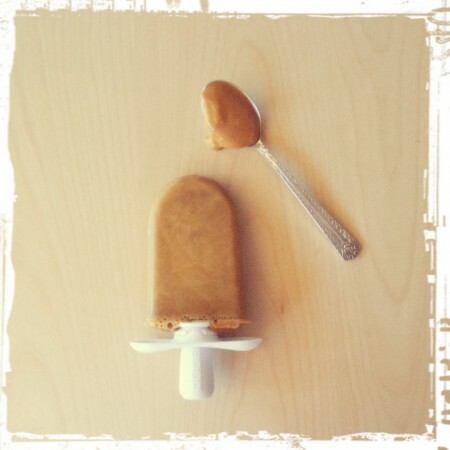 After being frozen, drizzle the popsicles with dulce de leche, and, if desired, stick on some popcorn pieces. The verdict on these was varied: I thought they were really good; my daughter only liked licking off the dulce de leche; my oldest son mostly hated the entire thing, especially the dulce de leche; when I asked my husband if he wanted a popcorn popsicle, his exact words were, “Oh, yuck!”; I didn’t even offer my 2-year-old one! 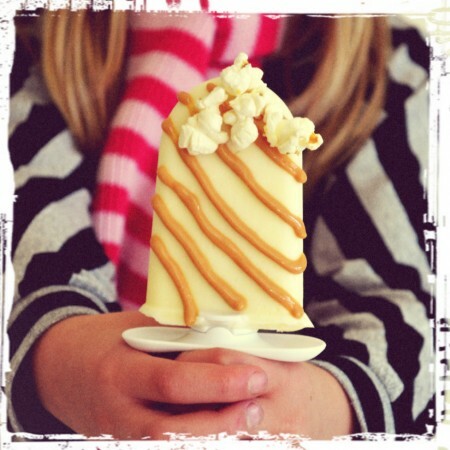 Find the recipe for caramel popcorn popsicles on the Zoku blog. I hope you like my faux Instragram photos (and popsicles!). I promise I won’t start posting Instagram photos here though, as I do enjoy clear, sharp photos of food over Instagram ones. But if you are on Webstagram, I will start posting there all the time as soon as I’m able to (and figure out how to)! A quick and easy recipe for dulce de leche Vietnamese coffee popsicles. Scoop the dulce de leche into the coffee and stir until thoroughly combined and all the dulce de leche is melted. Taste the mixture to make sure it is to your liking. Place in the refrigerator to cool completely. Pour into molds, as per the instructions for the Zoku, and wait up to 10 minutes to freeze (or just simply pour into plain old popsicle molds and freeze overnight). Jamie, you are the popsicle queen! All of your recipes sound delicious! The popcorn ones are so cute with the popcorn on the outside!